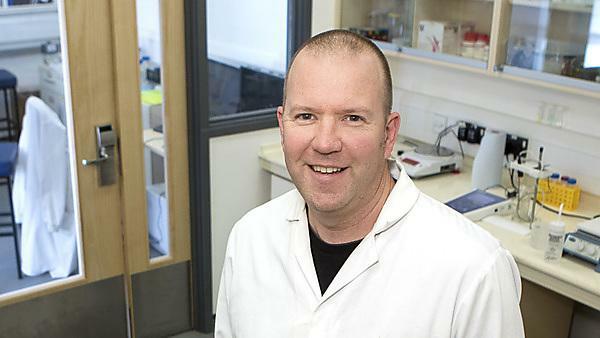 A biomedical research scientist is taking the lead in the creation of muscle cells and ‘micro muscles’ to test muscle efficiency in the laboratory – and he is able to carry out this new and innovative work thanks to the support he has received to get him back into science after a career break. Anthony Wynne from Plymouth University School of Biomedical and Healthcare Sciences is investigating the role of mitochondria (the ‘batteries’ of cells) in the metabolic system, specifically the processes which take place within the mitochondria which allow nitrates and nitrites in diet (in beetroot juice, for example) to reduce the oxygen cost in muscles during exercise, making them work more efficiently. In order to test this Anthony has developed a way of growing muscle cells which he has used to create ‘micro muscles’. These contract and act in the same way as muscles in the body and can be used to test the effect of nitrates and nitrites in safe, laboratory-controlled conditions. While there are obvious benefits to athletes in a better understanding of this process, there are also benefits to the elderly and other groups where muscle wastage and mobility are an issue. “This is piece of biochemistry is not well understood. If we can find out how nitrates and nitrites work in the mitochondria we may be able to use that knowledge to develop diets and therapies which will help people to exercise more effectively,” said Anthony. However, this exciting piece of work may not be happening at all if Anthony had not been given the opportunity to return to science after a career break. Anthony had worked in science at a post-doctoral level for 10 years before he and his wife moved with her job to the South West. With his wife in full-time employment and with two small children, Anthony became a ‘house husband’ and child carer and took a break from his scientific career. During this time he worked in boat yards and set up his own building business, but he still maintained an interest in science and spent his spare time researching his area of science and looking for ways to get back into it. Anthony began to attend talks at Plymouth University and while at one he met Professor Jonathan Pinkney from Plymouth University Peninsula Schools of Medicine and Dentistry. He achieved that goal thanks to the Biotechnology and Biological Sciences Research Council and the Daphne Jackson Trust, which awarded him a Fellowship. He also received some funding from Plymouth University. The Daphne Jackson Trust is the only charitable organisation in the UK solely dedicated to returning STEM (science, technology, engineering and mathematics) researchers to their careers following a break of two years or more. The Trust offers flexible, part-time, paid Fellowships, for two or three years, in UK higher education institutions and research establishments. Fellows undertake a challenging research project and an individually tailored retraining programme, re-establishing scientific credentials and developing an up-to-date research record. Working with Professor Pinkney and Dr Charles Affourtit, Anthony put together the proposal which led to his Fellowship and his current area of research.